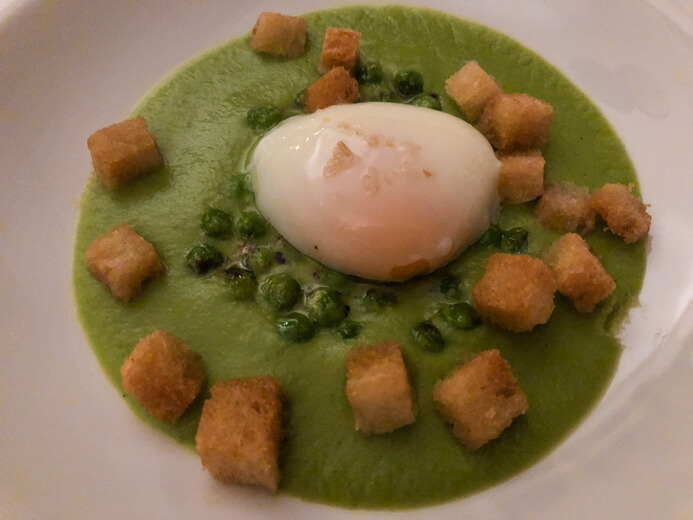 This Longueville House Restaurant review is part of a series of posts from my Munster Vales travel guide. 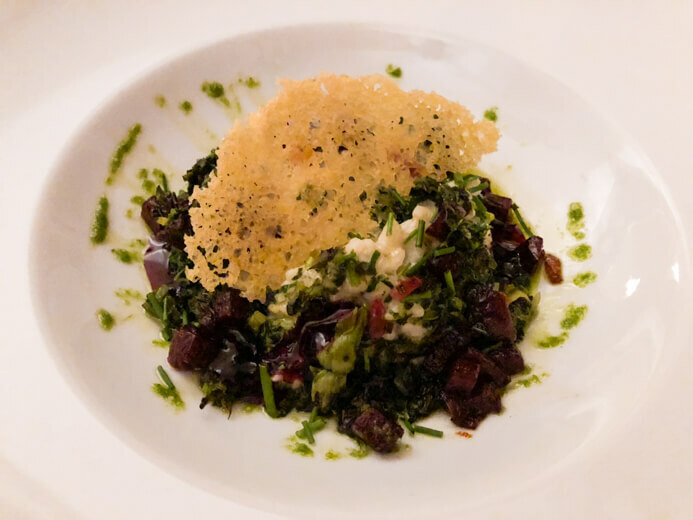 This Longueville House Restaurant review is the second part two of my blog posts on my stay at Longueville House. You can read about the hotel rooms, grounds and amenities in my Longueville House Cork review. 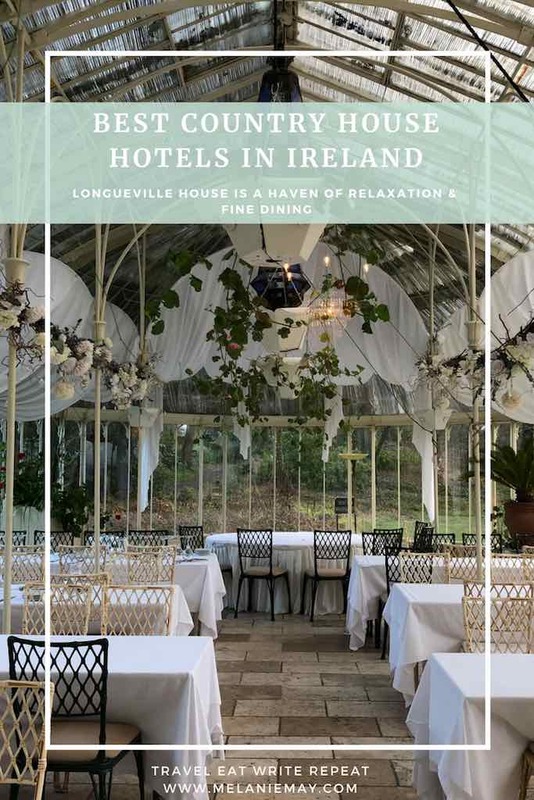 This Longueville House Restaurant review will cover the dinner and breakfast that you can enjoy in Longueville House. Click here to read my Longueville House Hot Apple Cider recipe. Dinner for us began curled up on the sofa by the blazing fire in the lounge. Here we enjoyed a cocktail and pre-dinner canapés before being escorted into the Library Restaurant. The dining area is elegant but relaxed and the staff are wonderfully attentive and professional but without being stuffy. They made us feel right at home. Our menu tonight was an extensive seven-course Valentine’s Night feast featuring fresh produce from the garden, farm and river. The Chef is owner William O’Callaghan who trained under Master Chef Raymond Blanc at Le Manoir aux Quat’ Saisons in Oxford in England. 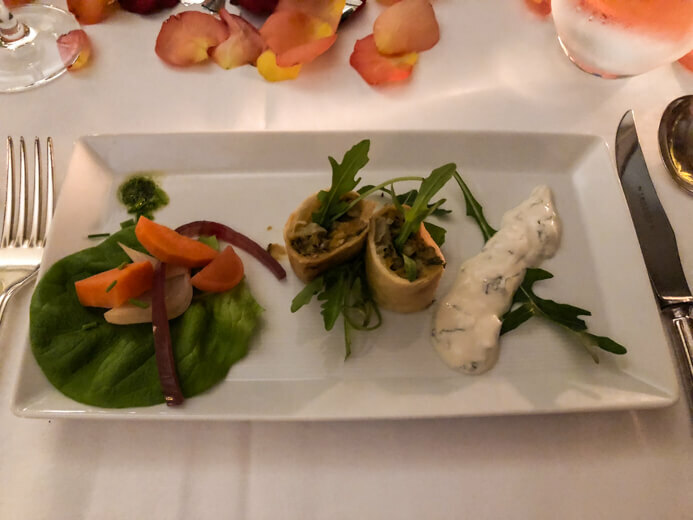 If you have read my blog about the state of vegetarian food in Ireland you’ll know that I don’t really expect much when it comes to vegetarian options. I know now not to get my hopes up. But I have to say, William wowed me with his thoughtful vegetarian menu. I hadn’t informed anyone beforehand that I was vegetarian and yet the kitchen was prepared and I was presented with some of the best vegetarian food I have eaten in a long time. In fact, my veggie options would tempt even the most carnivorous dining guest. However, before we get into the veggie food you can see the main menu in the photo below. Dave’s dishes were all plated beautifully and he enjoyed every dish and the only course he passed on was the cheese course as he really doesn’t like cheese unless it is melted on a burger. He even cleared his plate of the foie gras, of which he isn’t usually a fan. It must have been good. The suggested wines were a great mix of old and new world reds and whites with a port and sweet wine to finish. However, should you fancy something different there is an extensive wine list with carefully selected wines from the Old and New Worlds. You are sure to find something suitable to pair with your meal or to enjoy by the fire in the lounge. The knowledgeable staff are only too happy to help you with your decision. My first course was lentil spring rolls which were hearty and crisp and plated very beautifully. It is so wonderful to see lentils on a menu. I love them and I think it is an underused ingredient in Irish restaurants. The second dish was described as ‘the perfect egg’, which lived up to its name. It was cooked for an hour and had a delicate wobble to it. It was served on a sea of silky pea purée with pea mousse and smoked thyme crisp. The third course of St. Tola Goat Cheese mousse served in a crisp crispy garden Jerusalem artichoke had the most wonderful combination of textures and flavours, something that a lot of vegetarian food is lacking. 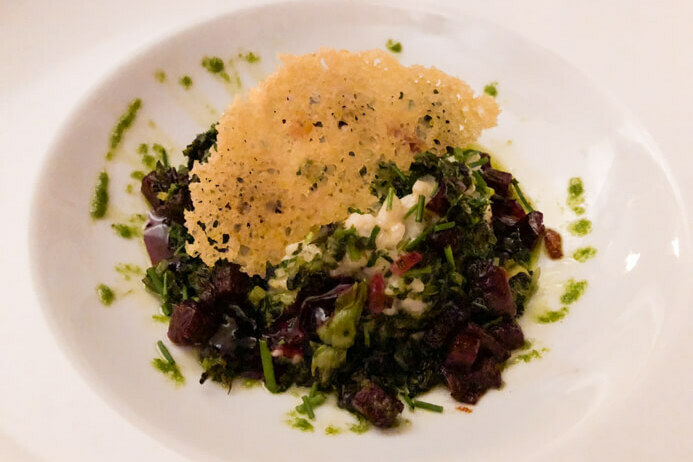 The fourth course was a light and creamy beetroot risotto with herbs, spinach and homemade pesto. And yes, I know I give out about risotto being served to vegetarians all the time but seeing how the first three course were so different and creative, I’ll let it slide this time. Besides, this risotto was very well-balanced, glided off the plate and wasn’t stodgy at all. The fifth course was a selection of Irish cheeses served with walnuts, garden chutney and cheddar crackers. The food just kept on coming. 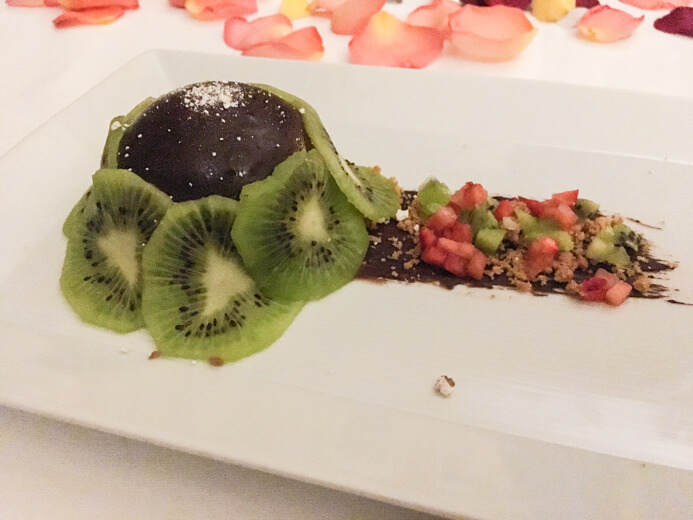 The sixth course was a chocolate dome that encased a very nice rose and cocoa mousse. There was a good hit of rose in the mousse and the dessert was reminiscent of Turkish delight. 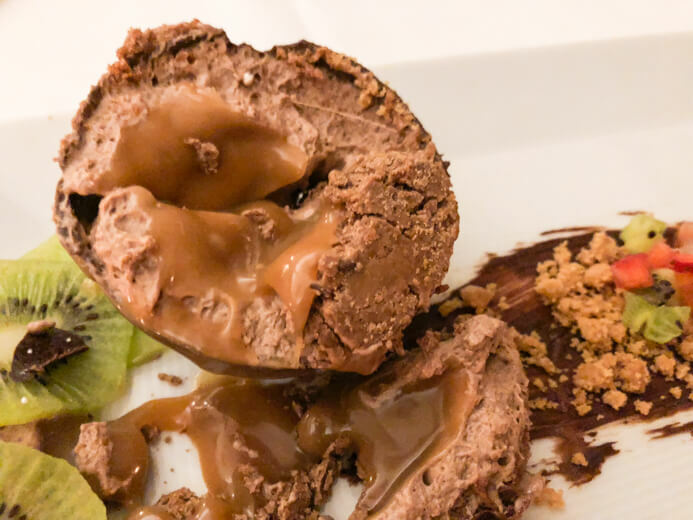 The sweetness and creaminess of the mousse were balanced with ginger crumbs and kiwi fruit. An unusual combination but one that worked well, especially if you like your food with strong flavours, as I do. We retired to the lounge to digest the meal and sip strong coffee served with macarons. They certainly like to keep you well fed in Longueville House. It really is a gourmet haven and gourmand destination. William O’Callaghan is a chef that really understands his ingredients and knows how best to cook and serve them to make the most of the flavours and textures. It is contemporary Irish food with a French influence. Nothing was masked with rich sauces. You can taste each ingredient and there wasn’t one unnecessary item in the dishes. It was a treat to eat such well-thought-out food that celebrated each ingredient as if it were the star of the dish. William and his team are very deserving of all the dining awards they have earned. Speaking of awards, the Georgina Campbell Irish Breakfast Awards 2018, in association with Fáilte Ireland, crowned Longueville House the winner of ‘Best Breakfast in an Irish Country House’. Breakfast in Longueville House is another feast. The cold buffet includes poached, stewed, fresh and dried fruits, yoghurt, cereals, grains, oven-fresh bread, freshly squeezed juices, cheeses and roasted ham on the bone. Here is a video of the cold buffet options. There is also a hot breakfast menu cooked to order, including a full Irish breakfast with free-range, estate eggs, black and white pudding, rare breed pork sausages and bacon, potato cakes, mushrooms and tomatoes. 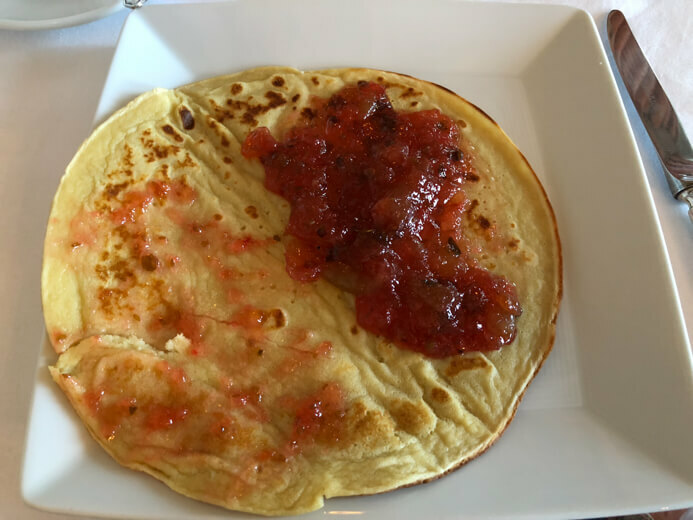 I opted for the crêpe with garden berry compote but if you fancy fish for your breakfast there is the option of fresh catch of the day landed in Castletownbere in Cork. 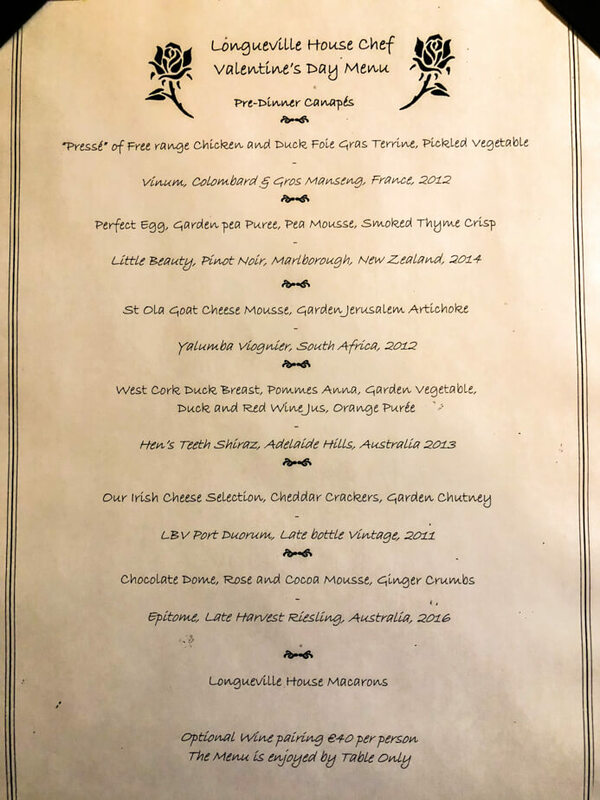 This is another thing that I loved about the food in Longueville House, all the produce served is given its provenance. It is clear that they are very proud of the ingredients they use. 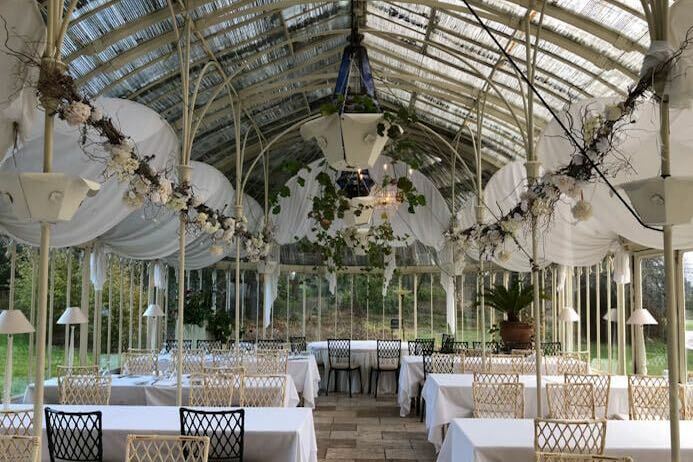 From the breakfast room, you can take in the magnificent curved-ironwork of the Victorian conservatory which was added to the house in 1866 by Richard Turner, the greatest ironmaster and designer of glasshouses of the Victorian era. 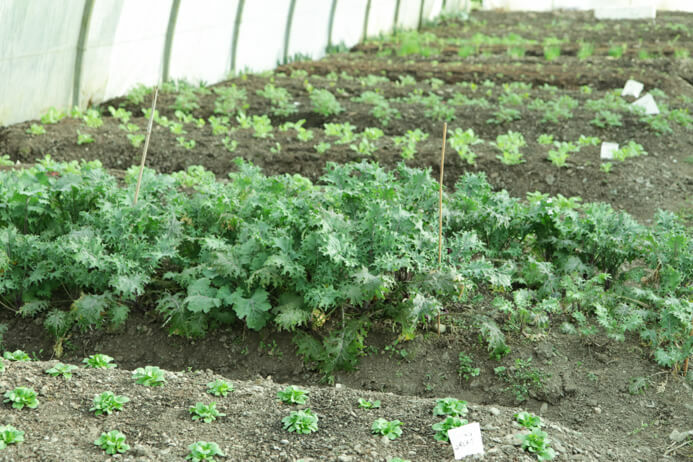 After breakfast, we got a tour of the estate and the three-acre walled kitchen garden with its extensive greenhouses and poly tunnels. Rubert Atkinson, the Sales and Marketing Manager of Longueville House Beverages, was our knowledgeable and enthusiastic guide. He is so proud of the gardens but especially of the orchards. 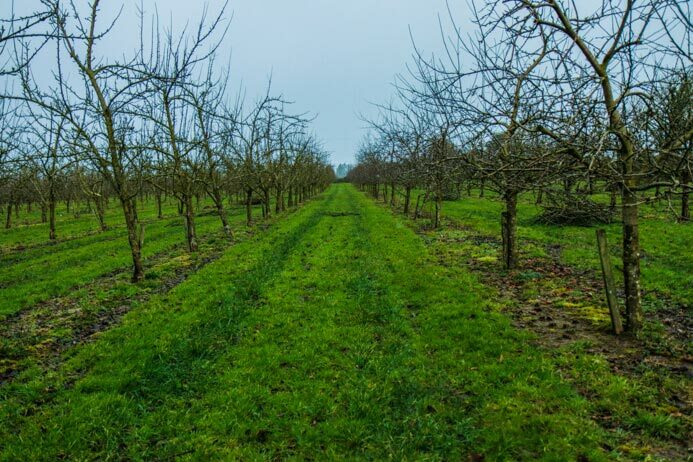 You can read all about Longueville House Beverages, the orchards and the cider and Apple brandy in my post Longueville House Hot Apple Cider recipe. 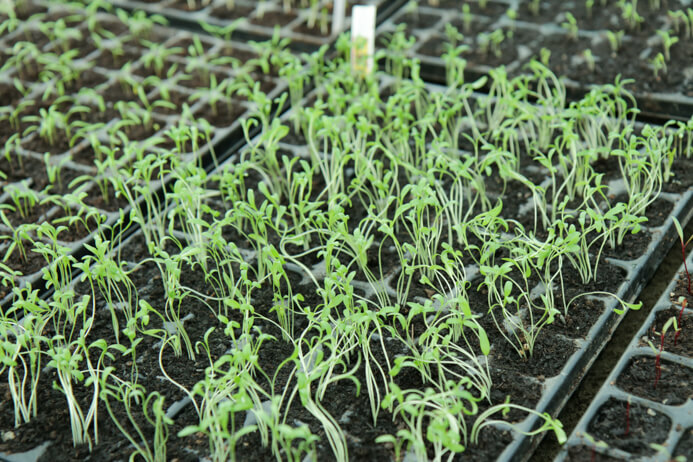 Longueville House is practically self-sufficient and must have one of the best herb and vegetable gardens in the country. William explained how expensive and labour intensive the garden work is and how it would be cheaper to buy in the produce. But that’s not what he is about. That is not his cooking ethos. Longueville House is a field-to-fork operation and that is what makes it so wonderful. William, and his staff, truly are champions of Irish food. Overall, dinner in Longueville House is an elegant yet relaxed affair. It is fine-dining without any stuffiness or pretentiousness. The staff go out of their way to make you feel comfortable but they do so without any fuss. They are consummate professionals that serve with a smile. As for breakfast, well, it is award-winning and certainly sets you up for the day with its fine choice of seasonal, estate-produced and locally sourced produce. Longueville House truly is a destination that all gourmands should experience. Thanks to Tríona O’Mahony of Munster Vales and Aisling and William O’Callaghan for organising our dinner in Longueville House. 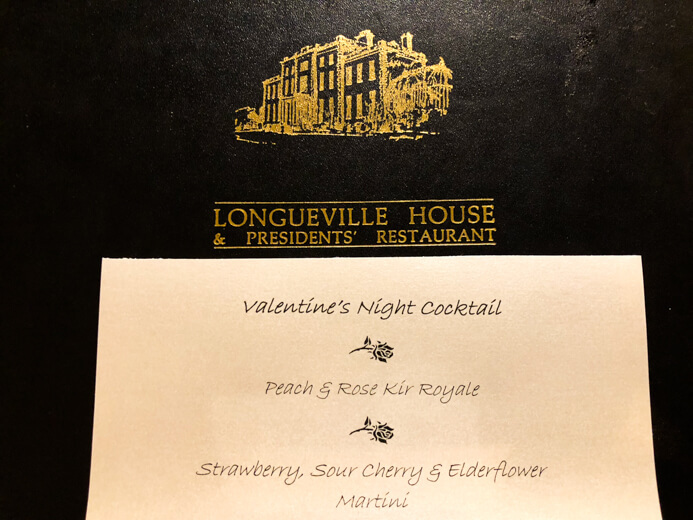 Do you have a Longueville House Restaurant review? Let me know and I’ll link to it from this blog. 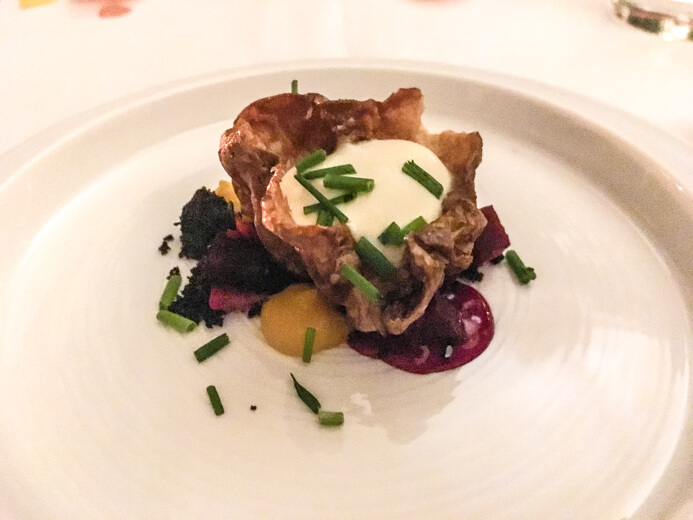 Have you been to Longueville House Restaurant and did you love your meal as much as I did? Let me know in the comments below. I love hearing from you. 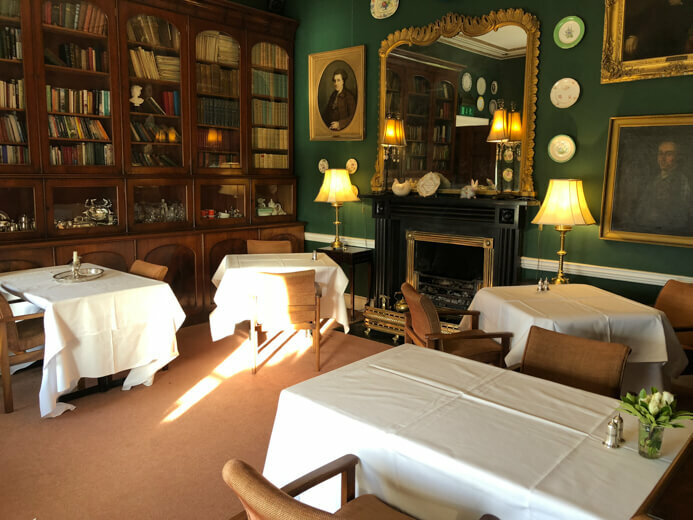 If you liked this Longueville House Restaurant review you might also like my review of the Finn Lough Bubble Domes in Northern Ireland. 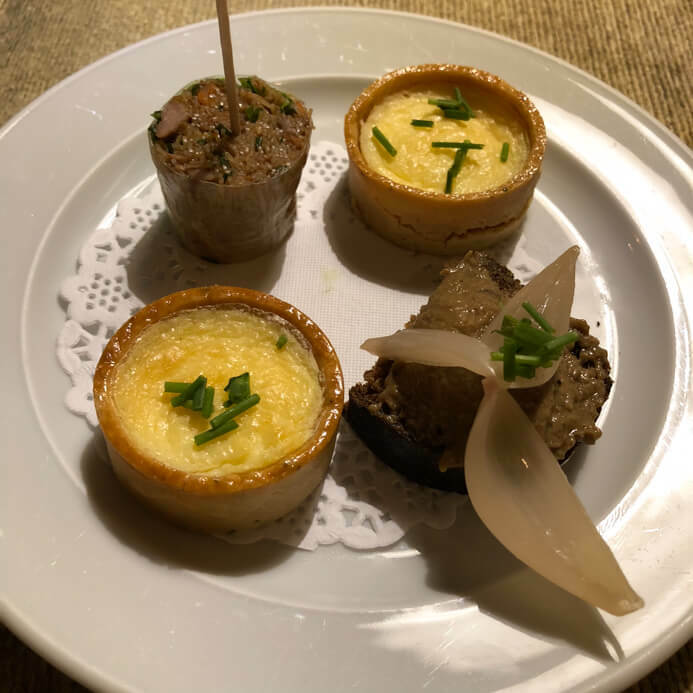 Additionally, you might enjoy reading my review of the Pullman Restaurant in the Glenlo Abbey Hotel in Galway, Ireland. Another blog you might like is my review of the Abbeyglen Castle Hotel in Galway, Ireland. 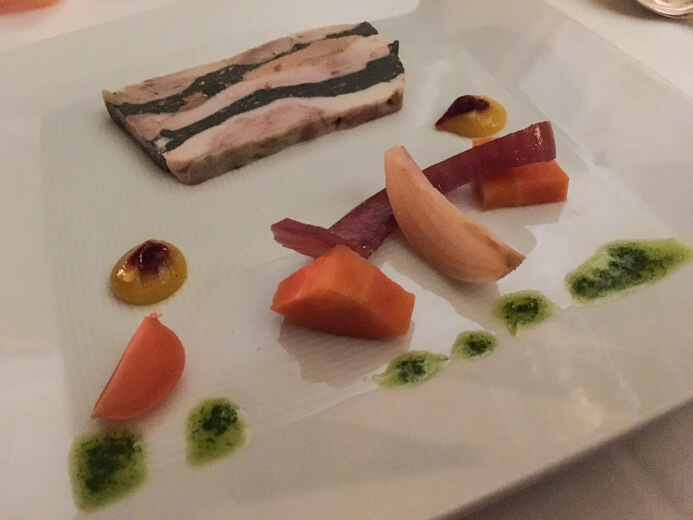 If you liked this Longueville House Restaurant review, please share with others.